GENERAL MOTORS (Canada), GM-567 1,425hp. Imported to Sri Lanka from 1954 onwards. 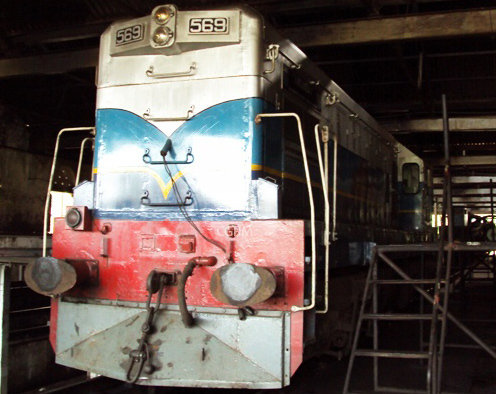 The most successful locomotive in the Sri Lanka. Almost all locomotives are still operational. 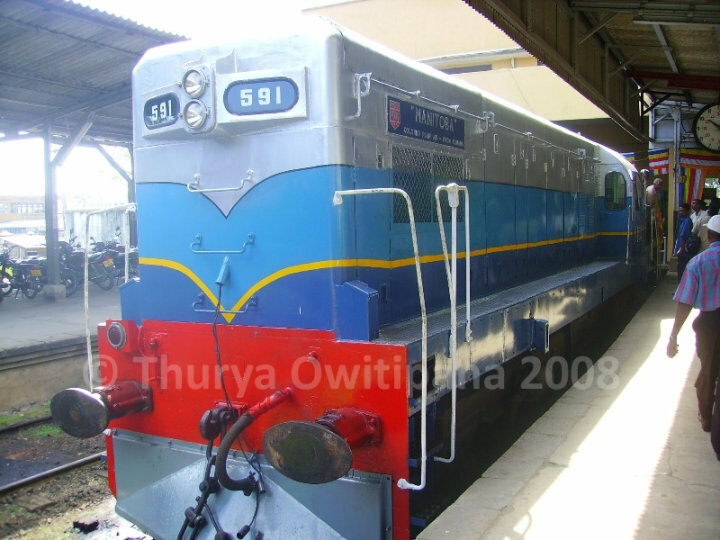 From 1954, Several Batches of ‘General Motors Manufactured Locomotives’ Imported to Sri Lanka under “The Colombo Plan”. Normally called as “Canadian” engine. But there are two classes of Canadian engine in SLR. Other one is Class M4. There was a popular story about M2s and Ruhunu Kumari, Yaal Devi and Udarata Menike that those three trains were commenced on same day with M2 #569, #570, #571 respectively. Those three trains were in commenced on one day but also the locomotives hauled on their maiden journeys were not the ones mentioned above. Ruhunu Kumari train went on her maiden journey on 24th October 1955 and the rest was on 24th April 1956. Locomotives went on the maiden journeys were M2 # 569 ‘Ontario’ for Yaal Devi and M2 # 572 ‘British Columbia’ for Ruhunu Kumari and Udarata Menike both. Only one non-functional engine is No. 571 “Saskatchewan” which destroyed by LTTE on 14th September 1985. M2 570 Alberta 1954 Trapped in Kankasanthurei (KKS) due to war since 1992 to 1996 after hauling last night mail to KKS. On 2007.06.07 slight damages due to land mine in Punani. M2 571 Saskatchewan 1954 Destroyed by terrorists on 14th September 1985 near Mollipothana on Trinco line. Other miscellaneous: M2a 591 “Manitoba” Caught by Tsunami near “Paraliya” (Coastal Line)” 26th December 2004. Alternator rusted, removed from the engine. After 591’s alternator destroyed, it was replaced by 593’s alternator and when 569 came to overhaul repairs, 593’s alternator was replaced by 569’s alternator.